Put pears in a large saucepan or wide sauté pan with the granulated sugar, vanilla bean, cinnamon stick, wine, and 1/2 cup water. Simmer gently, covered, until pears are tender when pierced with a fork, 10 to 15 minutes. Spoon out pears and set aside, loosely covered with plastic. Boil poaching liquid over medium heat until thick and reduced to about 1 cup, about 30 minutes (take care not to reduce the syrup too much). Chill until cool, at least 1 hour. Meanwhile, heat oil in a large frying pan over high heat. Add pepitas, brown sugar, and cayenne. Cook, stirring often, until seeds are toasted and brown sugar has softened, about 3 minutes. Mix 1/4 cup of the syrup with mascarpone. Arrange pears on a serving platter. Dollop mascarpone mixture on or beside pears, drizzle syrup over pears and mascarpone, and sprinkle with pepitas mixture. Make ahead: Through step 3, 1 day ahead; chill pears airtight. Wine pairing: Ceja 2008 "Dulce Beso" Late Harvest Sauvignon Blanc. 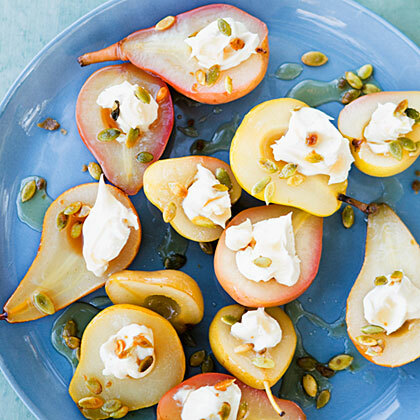 This sweet version of the wine the pears are poached in extends the flavor package. Like the pear dish, it has beautiful acidity to cut the sugar.